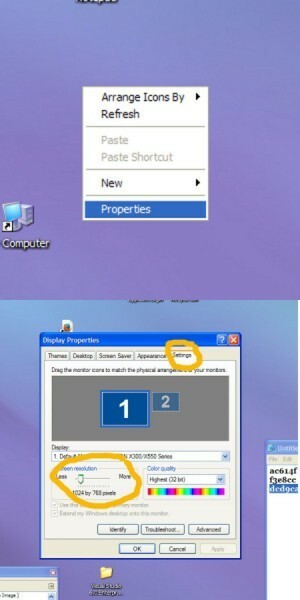 Generally you will not need to change the resolution on your computer monitor. However, there may be an occasion when it is necessary to make an adjustment. This is a guide about adjusting the resolution on a computer monitor. How can I change the pixels and resolution on a fairly new computer tower and an older monitor that was given to me? Web pages are way too big and all my pictures are blurry. RIGHT click somewhere on the desktop. A box will open up. And from there the monitor settings can be adjusted. When they are good, click OK. Depending on the monitor type there may have been an accessory program loaded to your PC when you installed the video driver. Activate this program and look around, you may find a place to adjust your resolution and pixel depth. More than likely Mrs.story gave you the best advise. In the bottom right-hand corner of your screen, you should see a number. If it is greater than 100%, click on the adjacent down-arrow and select '100%'. If the text is still too large, go to the top tool-bar and select 'View'. My screen is going from normal to a bigger size. When this happens an icon appears at the tip of the arrow. Sometimes the screen goes back to normal size automatically while I am still browsing or I have to change it to the 100%.